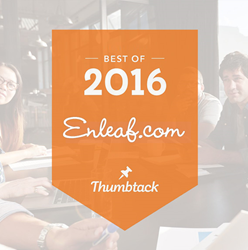 Enleaf is poised for growth and certainly appreciates the honor of winning the 2016 Thumbtack Best Web Design Company Award. Enleaf has been given this prestigious award for the second time in a row. Their first win was in 2015. This award should come as no surprise to the countless happy customers that Enleaf has garnered. Even through exponential growth and re-branding, Enleaf has maintained the highest level of service and attention to detail. Adam Chronister, the company’s Director of Web Design & Marketing, is very enthusiastic about receiving this award again. “You work hard, and have a true desire to help others find their success, and it’s great! Then you receive recognition like this and it just takes you to a whole different level of satisfaction,” he says. Over the last year, Enleaf has rebranded their company to approach a larger market share and be more competitive in that realm. While local clients have historically been the backbone of Enleaf’s business, they are ready to expand and take on larger scale projects. Enleaf believes in constant employee development and training to keep their skills relevant. This development translates into on-target marketing and development plans for our clients. Enleaf is able to work smarter, take on bigger projects, and show clients greater ROI. Enleaf provides Digital Marketing, Web Design and Design Services, Branding Development, and Social Media Marketing Packages. Please feel free to contact Enleaf with any questions or potential projects.